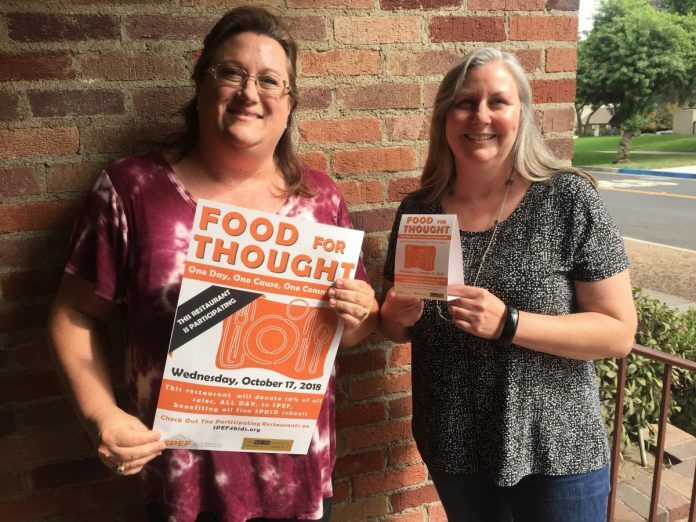 PHOTO: South Pasadena Educational Foundation | SouthPasadenan.com | Stacey Petersen, the executive director for SPEF, and PJ Lutz, the organization’s program coordinator, encourage South Pasadena residents to support Food for Thought on Wednesday, October 17. It’s billed as “One Day, One Cause, One Community,” a major event that features local restaurants coming together in support of local education. 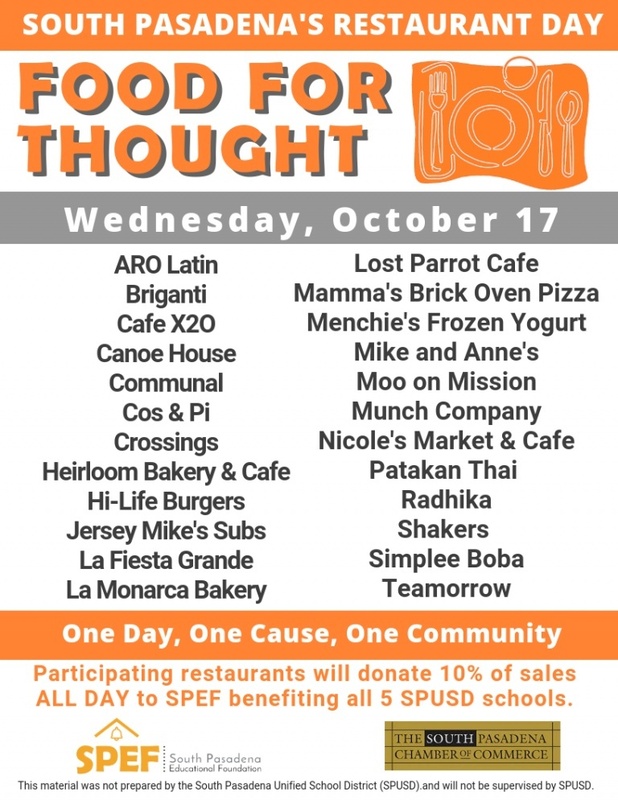 The South Pasadena Educational Foundation (SPEF), the fundraising arm for the local school district, and the South Pasadena Chamber of Commerce annually coordinate Food for Thought with area eateries while encouraging community members to dine out around town. The fundraiser, slated for October 17, provides residents an opportunity to get together throughout the day with family, friends and co-workers and help to make a difference for students. Participating restaurants donate 10% of all sales throughout the day to SPEF. It’s a win-win-win for everyone involved, insists SPEF Executive Director Stacey Petersen. This year SPEF board co-chairs Larry Abelson and Alex Kung, along with SPEF officials are operating the event with the local chamber. Funds will go into the SPEF general fund to support a variety of programs and activities. Will the event be a good time for those in the community? “It’s always fun,” said a smiling Petersen, looking forward to the big event. Participating restaurants include: Aro Latin, Briganti, Café X20, Canoe House, Communal, Cos & Pi, Crossings, Heirloom Bakery & Café, Hi-Life Burgers, Jersey Mike’s Subs, La Fiesta Grande, La Monarca, Lost Parrot Café, Mamma’s Brick Oven Pizza, Menchie’s Frozen Yogurt, Mike and Anne’s, Moo on Mission, Munch Company, Nicole’s Market & Café, Patakan Thai, Radhika, Shakers, Simplee Boba and Teamorrow.